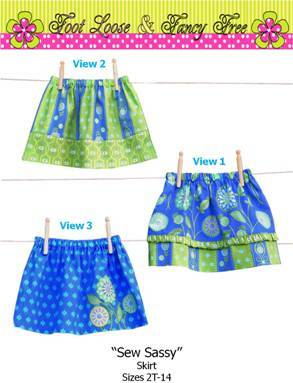 Super easy to make skirt in sizes 2T – 14. Simple lines yet very sassy and stylish. Elastic waist for great fit on any figure. Skirt can be made with a coordinating border, one solid color or striped with many colors. Use your imagination for endless looks. This design is very basic for the beginning seamstress but also has more advanced options such as the gathered insert and border hem. I have also added an updated one color skirt with an appliquéd flower, leaves and rick rack design.